This book is a compendium of the basic tenants of the Hindu Religion and it embodies all the salient features of all the schools of Indian philosophy, especially of the vedantic School. 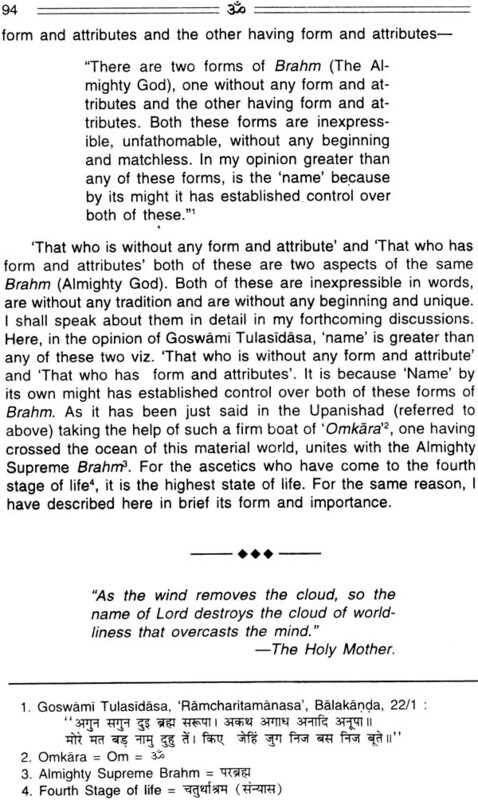 It throws ample light on the various conceptions of and suggests numerous ways and means to realise the True Self and have perception of the Almighty God (Brahm) and achieve permanent supreme happiness and liberation from all afflictions and cycle of births and deaths. H.H. Swami Vidyananda Giriji Maharaj, whose discources comprise this books was Principal of Vishvanatha Sanskrit College, Delhi, for 10 years and at present for the last 25 years, he has been the Mahamandaleshvara & Head of the Brahm-Vidya Pitha (a centre of vedanta learning), Kailas Ashrama, Rishikesh (Himalaya Hills) India. He enjoys international fame as a great exponent ofvedanta School of Indian Philosophy and as such has presided a number of times over the Parliament of Religion (Dharma Sansada) held in Delhi and Haridwara. He is author of nearly 50 books dealing with vedantic philosophy and Upenisheds. This book is considered as one of his master pieces and it has abiding value of a research thesis. It has already been translated into a number of languages and its English version is now published in response to the growing demand of a large number of his devotees. Worshipful homage to the eternal All-Pervading Divine Presence that envelops all things and indwells in all things. Countless reverential prostrations to That All-Pervading Universal Spirit inWhom all of us live, move and have our being every moment of our lives. The following lines are being written as an act of adoration and worship offered to That Ever-Present Reality. I regard it a privilege to give this Foreword to this book that constitutes a comprehensive and detailed exposition of the philosophy of the Ishavasya Upanishad. 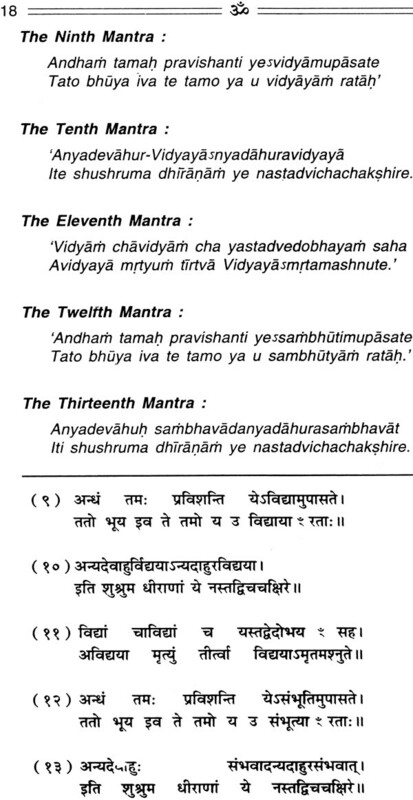 It is the first of the ten most important Upanishads that give us the essence of vedanta. 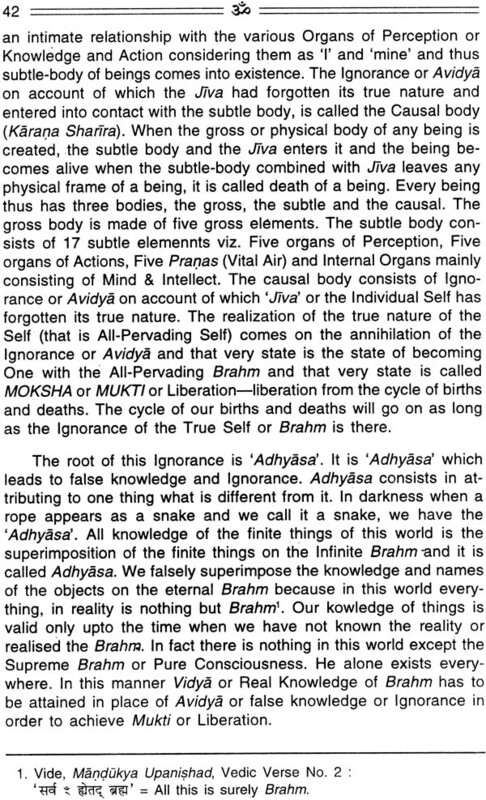 I am very happy to provide this English Foreword to this English language version of the original Hindi account which was first published more that 20 years ago under the title Ishavasya Pravachana Sudha, being a series of lectures on that Upanishad delivered by His Holiness 108 Mahamandaleshvara Shri Swami Vidyananda Giriji Maharaj, the head of the famous Sri Kailas Ashrama, Rishikesh. 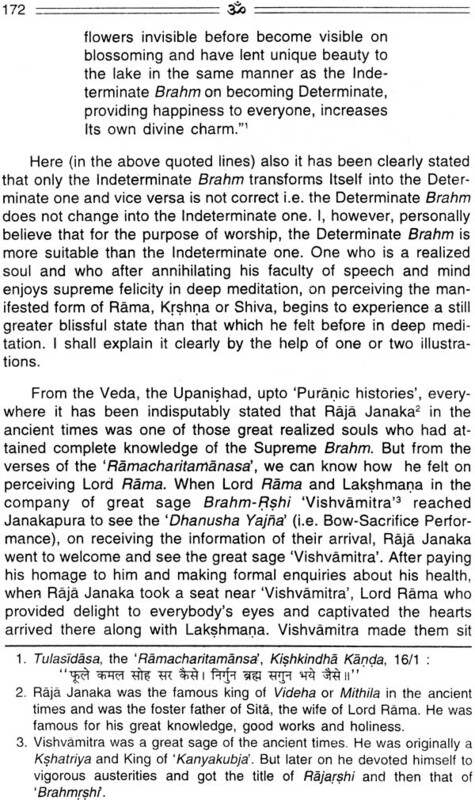 These original lectures were given in the city of Jamnagar of Gujrat in the spacious courtyard of the Bhirbhanjana Mahadeva Temple. His Holiness Sri Vidyanandaji Maharaj gave this series of lectures for a period of 50 days continuously expounding in most erudite manner, the sublime experience of the Ishavasya Upanishad. The result was this rare priceless unequalled publication containing his most learned and revealing exposition of the Upanishad. At the earnest request of the devotees, the fist Hindi edition was published many years ago. When those books were finished a second reprint was brought out during the centenary of Sri KailasAshrama about 10 years back. Now, under the auspices of the Silver Jubilee Celebration of the 25th year of Revered Mahamandaleshvara Vidyananda Giriji assuming the pontificial seat (Pitha) as head of the Kailas Ashrama, it is the great good fortune of the English reading public to get the golden opportunity of having access to this veritable mine of upanishadic knowledge and philosophical wisdom. This is indeed a matter of congratulating ourselves that the treasure is now available to those who are unable to obtain it from the original Hindi publication. I am very happy to recommend it to all sincere students of philosophy and spiritual seekers. I wish this publication widest possible circulation which it richly deserves. I hope, that the bringing out of this English version will encourage European publishers to have it translated into their national languages like German, French, Spanish, Dutch, Flemish, etc. This will greatly benefit the seekers in European countries. The translator of this English version deserves our warmest appreciation for this invaluable task. I congratulate the publisher for having undertaken this welcome publication. The Upanishads of India contain the spiritual knowledge and Philosophical statements of seers, the realised souls, ancient Rshis and saints of India. They largely form the concluding parts of the Vedas and so are also called ‘Vedanta’, Every religious thought of India has a relationship with the Upanishads. 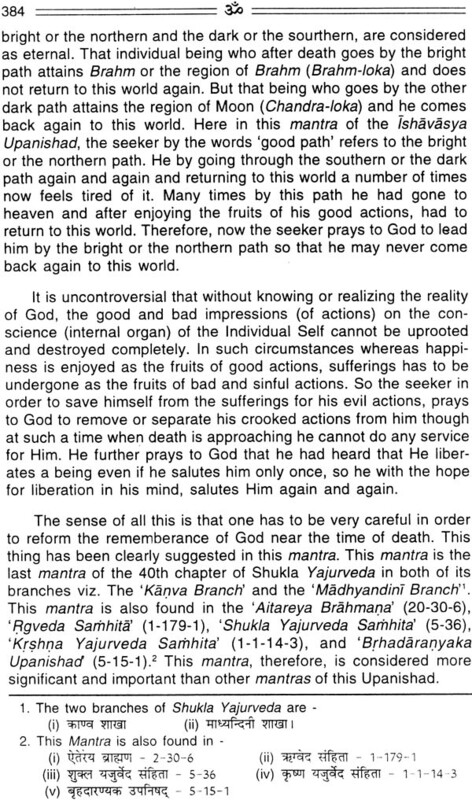 There is much truth in Bloomfield’s words: “There is no important form of Hindu thought, heterodox Buddhism included, which is not rooted in Upanishads” The Upanishads provide very satisfactory answers to the endless questions which crop up in the human mind about God, creation and the Self. A serious study of the Upanishads, undoubtedly, brings peace and happiness to the restless mind of every reader. The number of the Upanishads in the ancient times was over one thousand but in the present time only two hundred approximately are available. 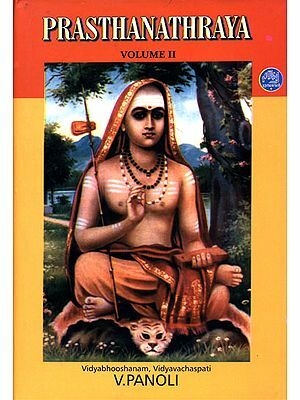 Out of these the principal ones are only twelve on which Jagatguru Bhagavatpada Adi Shankaracharya ji wrote commentaries. 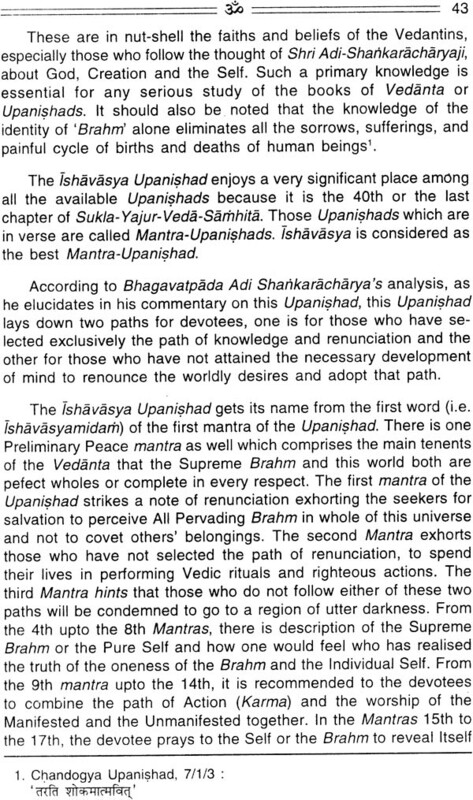 Of these Ishavasya Upanishad, being the 40th chapter of the Shukla Yajur Veda enjoys a significant place. 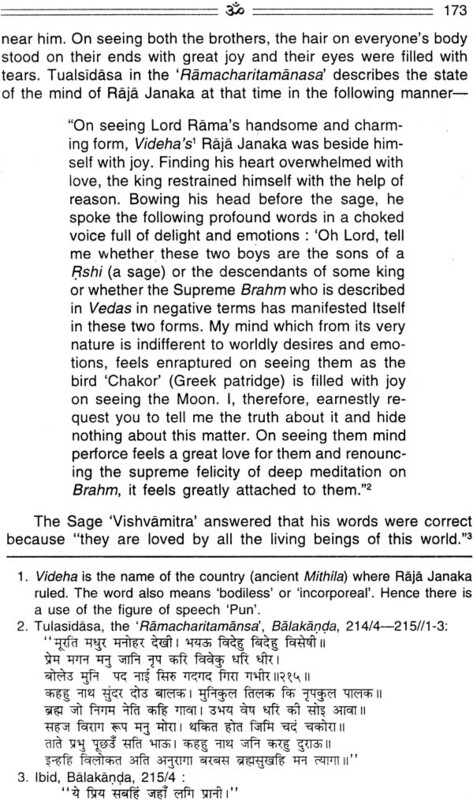 Among all the holy books of the Vedic thought, it enjoys the greatest popularity. His Holiness Shrimat Swami Vidyananda Giriji Maharaj, Mahamandaleshvara and Head of the Brahm-Vidya Pithe, Kailas Ashrama, Rishikesh, a number of years ago, delivered fifty discourses on the Ishavasya Upanishad, for fifty days during his ‘Chaturmasa’ observance, in the vast compound of the temple of God ‘Bhirbhanjhana Mahadeva’ in Jamnagar (Gujrat, India). 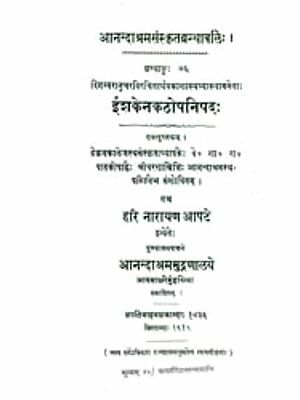 These discourses were delivered in the Hindi language and later on were published in 1971 in a book form titled as the ‘Ishavasya PravachanaSudha’ The second edition of this book appeared in 1982. Its translations in theGujrati, the Marathi & the Malayalam languages were also published. 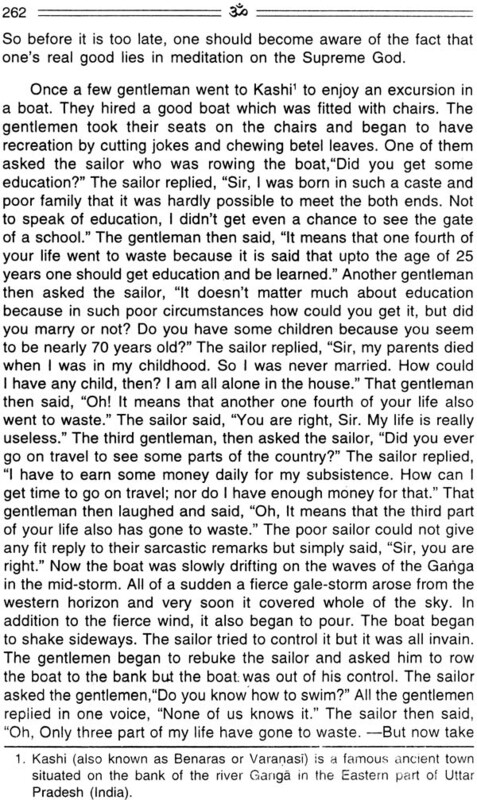 On the persistent demand of the devotees, its translation in the English language is now being published. It is hoped that this English version of the book will greatly benefit the English knowing readers. This book contains a very detailed analysis, explanations, elucidations and comparative study in-depth of all the verses (mantras) of the Ishavasya Upanishad, bringing out their spiritual, social and meditative implications. 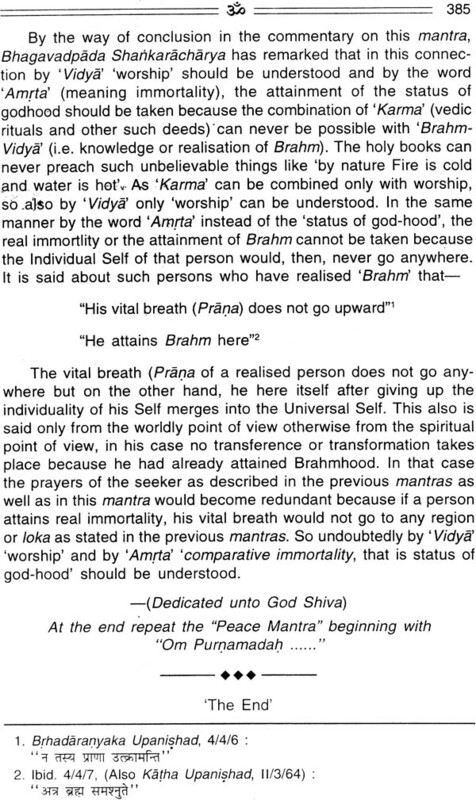 In the beginning of the book under the study of the Preliminary Peace Mantra of the Upanishad, a very enlightening and useful discussion on the multifarious meanings, worship and meditation of ‘Om’ is provided. 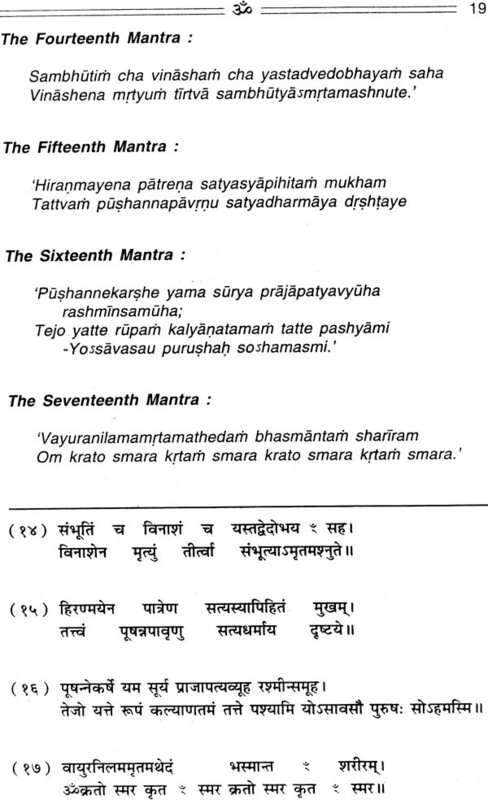 Besides it, the discussion of the Preliminary Peace Mantra embodies the discussion of practically all the main tenents of Vedantic philosophy and its comparison with the tenents of the other schools of Indian philosophy. 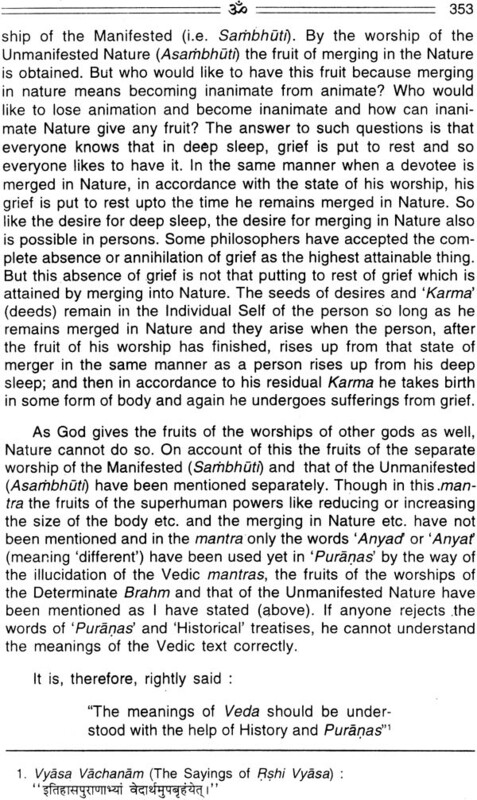 After this all the 18 mantras of the Ishavasya Upanishad have been elaborately discussed including the spiritual and social implications of their thought. The book, in fact, contains a compendious study of the whole of vedenta. A serious study of this book will provide a knowledge of all the salient doctrines and features of the Vedantic philosophy. 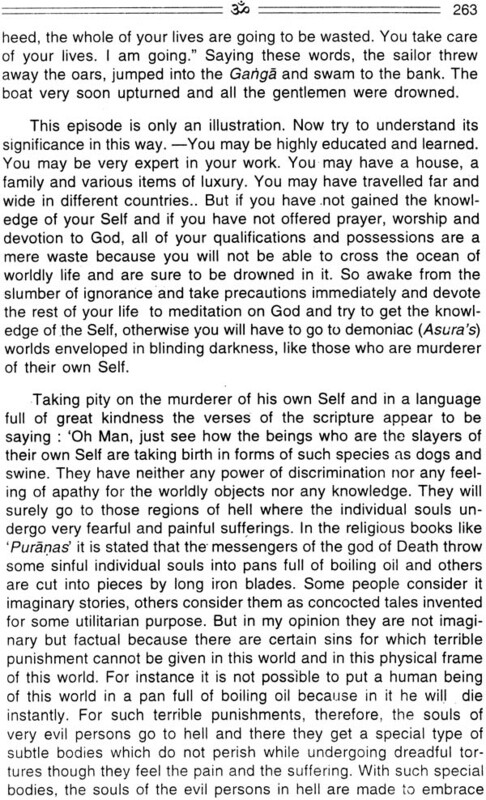 Effort has been made to translate this book in as simple English as possible to bring it within the comprehension of a common English-knowing reader. Personally speaking, I feel myself very fortunate to have under-taken the work of the translation into English of the Hindi edition of this book because it has immensely enriched my own spiritual knowledge. The work, no doubt, was a very tedious job because it is difficult to find out equivalents of many Hindi and Sanskrit words, especially of the technical terms, in the English language. Still I greatly enjoyed this job on account of the spiritual gain that it provided to me. I shall be failing in my duty if I do not acknowledge my indebtedness to Shrimat Swami Medhananda Puriji Maharaj, Manager, Kailas Ashrama, Rishikesh, for his many sided help in this task and my special gratefulness to the two learned Professors, Dr. Madan Gopal, MA (Sanskrit and English).Ph.D., Head of the Dept. of English and Research Studies and Dr. Ramesh Kumar Low, MA (Sanskrit), Ph.D., Head of the Dept. of Sanskrit and Research Studies, (both of them of) S.D. Post-graduate college, Muzaffarnagar (U.P., India), for going through the manuscript of the present book and making many very valuable suggestions. I also express my sincere gratefulness to His Holiness Shrimat Swami Chidanandaji Maharaj for writing a Foreword for this book. For the nice get up of this book, the credit goes to Shri BhushanK. Kapur and Shri S.L. Tuli of Delhi. Thanks are also due to Shri Sunil Kumar & Shri Anil Kumar, (Elite printers, Delhi) for undertaking the printing of this book and taking a very keen interest in giving it a finished form. 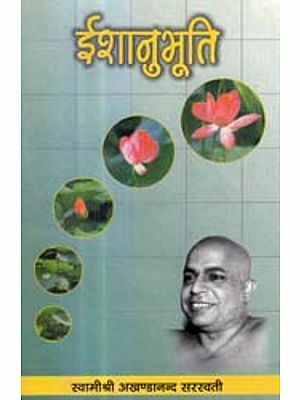 Needless to say that this book would not have seen the light of the day, if I had not gained inspiration from time to time from His Holiness Shrirnat Swami Vidyananda Giriji Maharaj, Dr.Umeshanandaji Maharaj and many other saints of the Kailas Ashrama, Rishikesh. Photograph of H.H. Swami Vidyananda Giri ji Maharaj & Swami Narottam Giri.